I’ve been wanting to write this for awhile. I dunno what stopped me, honestly. So, confession time: I like pens. And not just any pens - fancy-pants, hoity-toidy fountain pens. For now, I’m just gonna talk pens, probably. Inks can come later. I’m just gonna go from bottom to top. These are pretty much just the ones that live on my desk. I’ve got a handful of others, but these’re the ones I’d really recommend to anyone, depending on budget. Pentel Twist-Erase, 0.5mm. Uh. It’s a mechanical pencil, for when…I want to erase, I guess? Pilot Penmanship, EF nib. This one didn’t come with a converter, but makes up for it with a really great feel and a super, super thin line. Japanese pens tend to run narrower than usual, and this one’s certainly living up to that. Mine’s a clear demonstrator, but I might end up getting the black one at some point. It’s got these rad red flanges! Can’t beat that! Lamy Safari, Charcoal, EF nib. My very first fountain pen! You’ve all got this guy to blame. It’s still one of my favorites - puts down a narrow line, but still thick enough for the more entertaining inks to show off some nice shading. I’ve got a blacker-than-black ink in it pretty much permanently at this point. Lamy 2000, EF nib I recently discovered that this beauty has a unique red cousin - though, that one’s way, way, way out of my price bracket. Sheesh, that’s more than most cars. This puts down the smoothest line of any of my pens, and has a massive reservoir, too. Montblanc, EF nib. This one never leaves my desk. Nuff said. They’re all sitting on a Moleskine. I’ve tried other notebooks, but I like these the best, so far. I usually go squared rather than ruled or blank. Most of my project planning, brainstormed ideas and todos go into these. I usually label the spines with a silver sharpie so I can keep track of what’s living where. Recently I’ve gotten more daring about - gasp! - putting stickers on the fronts, or little pixel-esque stencils done with sharpie. You can just barely see the Pixatronic robo-dude peeking through in the picture. Finally. That’s a load off my mind! 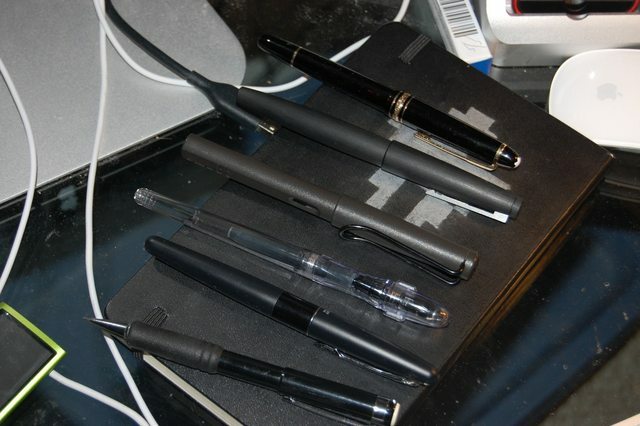 Maybe someday I’ll do a fancy-pants picture of my other pens, and definitely a list of the inks I usually use.